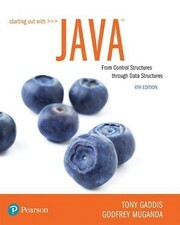 For courses in computer programming in Java. Provide a step-by-step introduction to programming in Java Starting Out with Java: From Control Structures through Data Structures provides a step-by-step introduction to programming in Java. This text is designed to be used in a 2 or 3 semester sequence and covers everything from the fundamentals of Java programming to algorithms and data structures. As with all Gaddis texts, every chapter contains clear and easy-to-read code listings, concise and practical real- world examples, and an abundance of exercises. With the 4th Edition, JavaFX has replaced Swing as the standard GUI library for Java in chapters that focus on GUI development. The Swing and Applet material from the previous edition is available online. Note: This ISBN contains an Access Code on the inside front cover that provides access to the Companion Website at www.pearsonhighered.com/cs-resources. 9780134787961 PDF is available as a free download.